I'm my own worst enemy, I play multiplayer games solo. I've been blamed on SGoYT made me buy this! 1. Play a game solo (absolutely anything you like, any way you like). 2. Come here and post something about it (as much or as little as you like). Add the <summary></summary> tag to include a short overview. All summaries are recorded, as on Albia's overview page. Add the <rating></rating> tag to rate a game on a scale of 0.5 to 5.0. Only the most recent rating for a game is recorded, as on Albia's ratings page. 3. Have fun (playing games and talking about them here). If you're an old hand with these lists then just get playing and posting. Leave your wallets, purses, money belts, etc at the door. They do not like it here. If you can, please post 1 and 2 about the games you play (more of either are welcome too). It's really helpful to those interested in the games and helps to provide a bit of balance to the usual SGOYT positivity (as this can be expensive ). I'm 44 this month so I'm giving away some Geek Gold. 1. Every item on this month's list will receive 0.44 GG. 2. Every 44th entry will receive 4.4 GG. 3. 1 item at random from the all the items posted on this list will receive a bonus 44 GG at the end of the month. 4. I reserve the right to get over excited and give away more GG, have more challenges, etc. 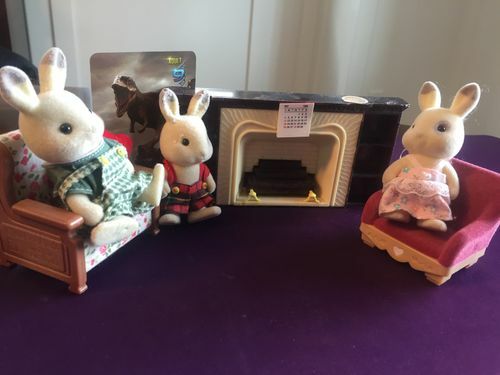 As it is also Easter this month so I will also tip any posts that have pictures of rabbits in them. Real or game components accepted. Feel free to be creative. 1 Player guild "Together, We Game Alone"
If you haven't joined the guild, please do. It is a great resource for everything around solitaire gaming! 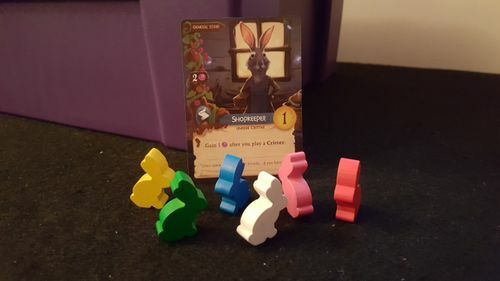 Solitaire Games on Your Table Monthly Geeklist SUBSCRIPTION THREAD - Sign up here to not miss out on future SGoYT lists. SGOYT QuickLinks - A collection of links to every SGOYT GeekList. SGOYT made me buy this! - If this list costs you money, go here to tell us all about it. 2019 Solo Challenges SUBSCRIPTION - A subscription list of every past and current 2019 solo challenge. The 2019 Solo and Coop Unpossible Challenge - A place to set and achieve a difficult personal solo goal or challenge for 2019. 1 Player Guild / SGOYT - 2019 Solitaire Goals - A place to set and track personal solo game goals for 2019. 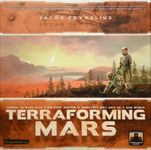 2018 People's Choice Top 100 Solo Games - An extensive list of the top 100 solo games as voted by solo gamers in 2018. Solo Gaming Awards - A list of links to various 1 Player Guild and solo game awards. SGOYT Aggregator - Aggregation of each list's games by Ones Upon a Game. Solitaire Games on Your Table Spreadsheet - An excellent resource for SGOYT data from 2013-2016. 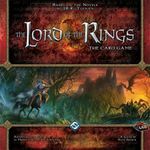 Solitaire Recommendations For Your Table - Want to know, what to get to the table next? 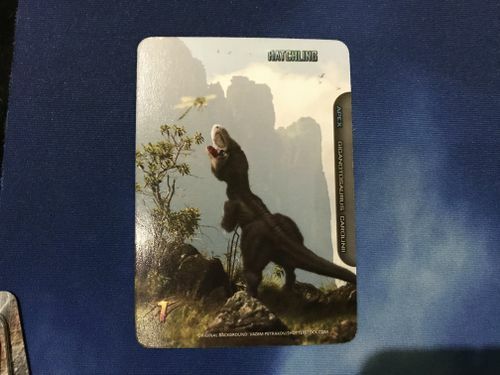 SoloPlay Variants Posted on the Geek - who needs an official variant? Solitaire Resources - A list of additional resources for solo gamers. 1 Player Guild Trading Post - Want to get rid of some solo games or trade for new ones? The Solo Games Chain of Generosity - An ongoing list where you can give and get games. 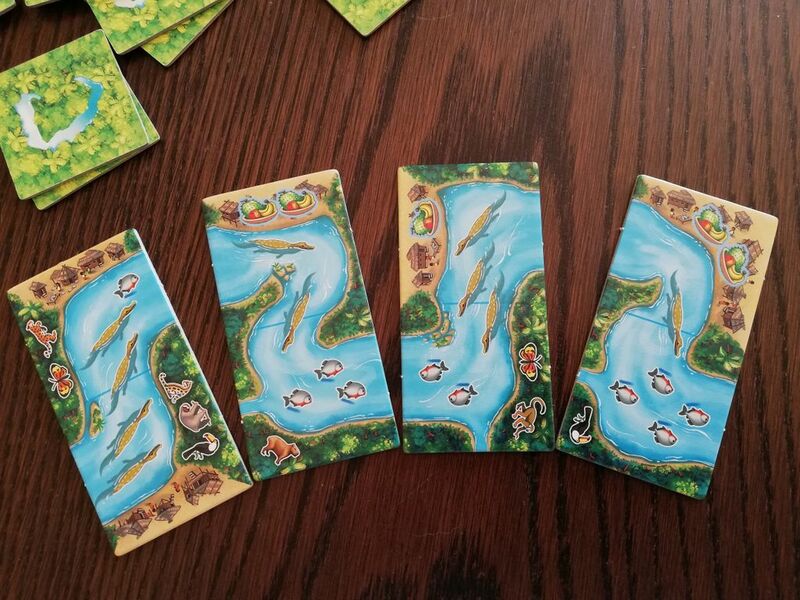 Solitaire Games - Fair Trade it Forward Part 2 - A place to pay it forward with solo games. 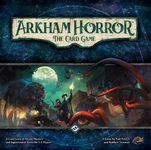 1 Player Guild Hot Deals Thread - A listing of current deals and discounts on solo games. 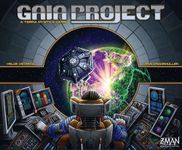 Auction Watch - A thread with links to BGG auctions for rare and hard-to-find games. Sock Puppet of the Week subscription thread - A subscription thread updated with the latest 1 Player Guild Sock Puppet of the Week. If you want to host a future list them send a GM to Ryanmobile letting him know what month you want to do. Disclaimer: The host (garyrbrooks) and the 1 Player guild take no responsibility for any purchases you make due to reading this geeklist. I'm still adventuring in Middle Earth with this fantastic game from almost a quarter of a century ago! This month I’ve been creating new rules and dream cards for my solo variant as well as having more fun by adventuring in Tolkien’s wonderful world. It really is a beautiful game and I’ve been reflecting (in Galadriel’s Mirror, obviously) on how to develop the solo experience further. I've had lots of new adventures with Radagast this month in my solo sessions and continued to create and refine some new solitaire rules to enhance Sites, Factions, Quests and more. My ‘There & Back Again’ weekly Blog has continued and I’ve designed even more dream cards – such as new cards to introduce Gold to MECCG and some simple rules that reflect the trading in areas such as Dale. My ‘hidden’ Location rules have been polished and are really working well, and mixed with my Travel rules, new Agent rules, the Environment cards and my Inn deck, really make the game more than a ‘hack and slash and grab MP’ experience. 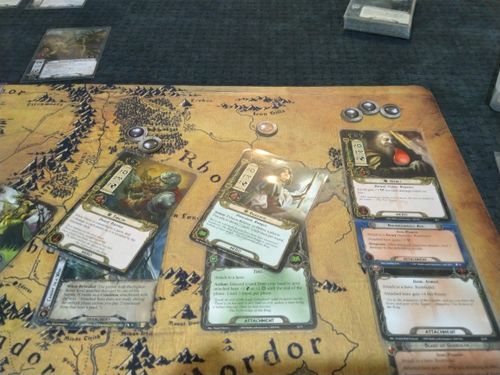 For example, in my solo sessions there have been times where no new ’Quest’ cards have been available for me to send my Characters after, so I began wondering what else they could do rather than just twiddling their thumbs (or smoking their pipes) in Rivendell? 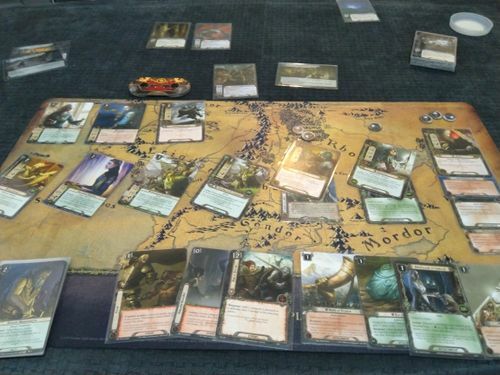 I came up with no less than 3 ‘small ideas’ to solve the problem – Training (which allows Characters to avoid being tapped when they use a Skill), Raids on Sauron’s domains (why do we need a Quest card for that? Grab your swords, boys!) and earning some gold (which, as any Dwarf will tell you, always comes in useful when buying drinks at Inns or helping to Influence certain Factions). I’m also in the process of thinking about ways to add all the lovely songs and tales from Middle earth into the game. Each month, as I add another tiny layer to this already incredible game, I’m very proud to think I have achieved in making a more immersive, story-driven solo game without making it (too much) more complex. 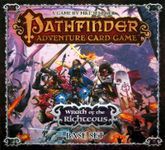 My latest adventures were based on the Radagast Challenge deck (with quite a few tweaks and additions to put it into line with my solo rules and deck format) and used all my player aids and solo rules. In my first session, Legolas led a group of elves across Middle earth, and in the second, Radagast was the main focus in trying to recruit all the animal Factions in an effort to defend Mirkwood from invaders. What I love about MECCG is that it's dripping with theme and storytelling – and I hope with the rules I’ve been testing and developing, even more immersive. It’s such a great way to spend an afternoon. Just picked this one up and already have played it many times. I find the multi-use card idea fantastic. A bit awkward to hold though. How do you all use the feats? Play like a campaign where you try to unlock them all or just try for a highest score? Arkwright has been on the table for about a week. I soloed the Spinning Jenny two-handed from Rahdo's Runthrough position but pretty much screwed it up. The second play went better, and by the third play I was ready to add a third player. So today's fourth solo was the Spinning Jenny but adding in the economy tiles from Spinning Mule. I really like the economic model and the tough decisions. 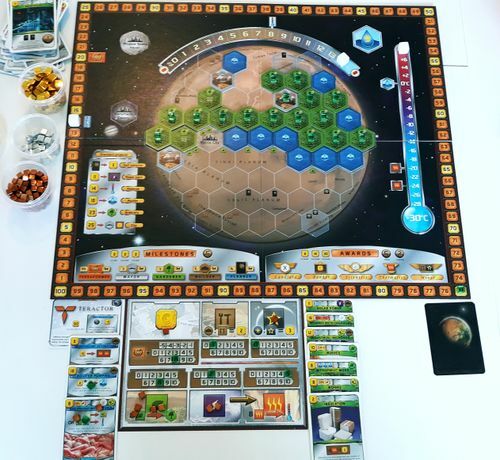 I'm ready to start again with a fourth player, then it's full Spinning Mule with economy, event, and development tiles. Three-handed Spinning Jenny with economy tiles. Scales well from two to four players. 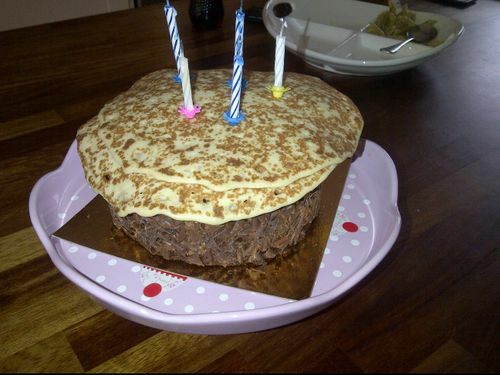 The wife won't touch it, "too thinky!" April is a wonderful month: the sight of bees and birds, the fragrance of flowers and fresh-cut grass, the opening pitch of baseball season, and the roar of fearsome predators clashing over limited prey in a fight to the death. Apex is a lovely little deck-builder. I do prefer it solo. My brother and I have played a 2p variant (of our own) that does not use the Battle Royale from the rules; instead, we are co-operative apex predators trying to take down the boss. 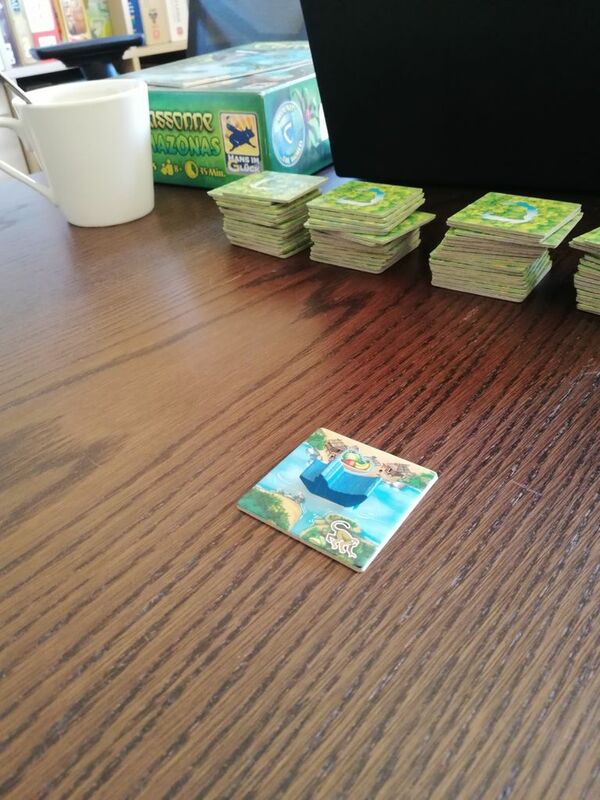 Basically we take turns, and refill the game trail and evolve pool for each of us on each environment card/turn. It’s fun. But not quite as good as solo. Planning my 2019 10x10, I noted I hadn’t played this game in two years. So in my first game back, I went pretty easy: a relatively tame foe (Carcharodontosaurus Saharicus) and a pretty straight-forward species for myself (Giganotosaurus Carounii). This is me as a child. This is me on a bad hair day. This is me stalking a family of rabbits in their natural habitat. During this game, enemies kept killing off my pack, but—-for better or for worse—-I kept pushing the juveniles in my hand into the path of danger. That's the only way they will get any tougher. Kids have to learn the hard way sometimes (which was like the time I caught a fly ball as a college student at a Braves game with my glove lifted three feet above all the gloves of the second-graders around me; they all looked at me in expectation that I would give the ball to them, but I’d been coming to MLB games for years with nothing to show for it). So just like in baseball, you sometimes have to make sacrifices to win. Don’t they keep track of that as a stat? Because of this, by the time that final clash came with the boss, my deck had shrunk down to five cards in hand with another two waiting in ambush. Then, with Acute Alertness, I could move a played card back into ambush. So basically, a perfect trap was set for the Carcharodontosaurus, or any foe for that matter. Although shortly thereafter a meteor smashed into Earth. 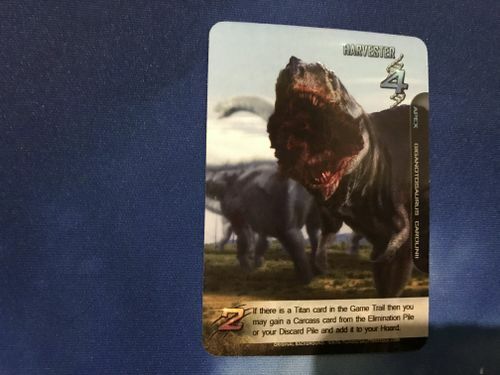 No surprise, though: that’s how this game's cute timer mechanic works--the last environment card which your apex predator must face is a the global cataclysm that leads to extinction. Eat and reproduce while you can, folks. Despite that downer, this is still fun. I usually listen to the Jurassic Park soundtrack while playing. 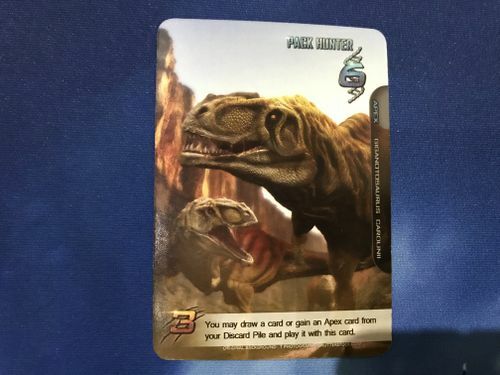 This drowns out the roars and screams I make as I move cards around on the table. This, in turn, prevents my wife from...wondering. So what are you waiting for? Play ball! 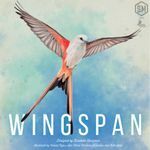 Wingspan had the honor of being my first game for this month (though I didn't pay any attention to the rabbit comments till after I had packed the game away, so they weren't able to sneak into the photos). I've been rather busy with other things so I haven't gotten Wingspan to the table as much as I would have expected, but I do expect that to change, and I think I will try my hand at making a few custom cards for it too (Haast Eagle will be my first attempt, now that I have its ability all sorted out). This session saw me trying out a forest based engine (ish), which ended up working out quite well. 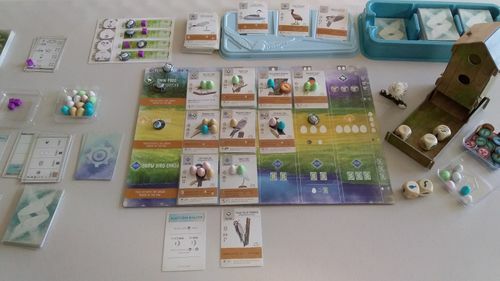 No power cards came into play this game (crows, etc), and while all of my initial birds were low pointers I did manage to get out some higher scoring ones later on. Playing with the Automabon Society card on normal difficulty I managed to eek out a victory with 88 points to the automas 83. I prefer this solo as I like the puzzle aspect of figuring out the best solution without "discussing" with other players. Here, I just set up the beginning of a play through of the entire adventure path. 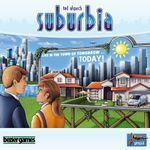 Followed by a quick game of Suburbia using the Lone Architect rules. This is the first time in a while that I have focused on Residential so heavily. It sort of worked, with a final population of 74, but I was sitting in negative reputation and income by the end of the game with my money almost gone as I wasn't able to get a decent income built up at the beginning of the game. Enjoyable session though. I am quite happy with the version I have (hence I didn't back the KS for the deluxe version as I couldn't justify it), and Lone Architect is my preferred way to play it solo. 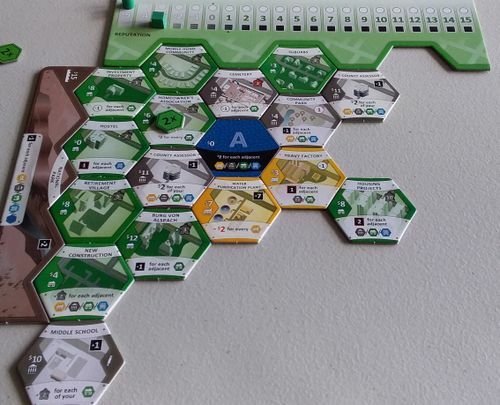 It's a great game and the way the mechanics mesh with the theme is brilliant (and hence why this suburb was so poor ^^). Just got this delivered via Kickstarter. 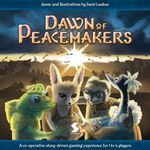 An interesting and light 1-3 player game which is good to have in your collection as a filler for those times you have an odd number of people. Haven't played it with 3 but the solo mode auto-pilots it self for the most part but there is some long term thinking involved to figure out how you get to point A to point B. You normally lose because you didn't think about your card placement early enough or didn't take a gamble when you should of. I'm still figuring it out but not sure if it'll hold interest for much longer. How many German subs are in this game? All. All the German subs that saw service in World War II are represented in this game. It has an epic scope. 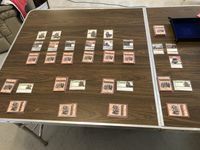 I played the "Not So Phony War" scenario whose time frame is from September of 1939 to June of 1940. Over the course of the game I was able to sink some 1,505 tons of shipping along with the battleship HMS Nelson. The result was "a draw". I liked it. However, beware. It takes a long long time to play and leaving it set up would be difficult if you don't have a dedicated cat free environment where in you could let it sit unsupervised. I used VASSAL which was a great help. The rabbit is Shelby Theodore Angelo, one of my Eldest Spawn's favorite critters. He's not usually much of a gamer, but he heard we needed rabbits. 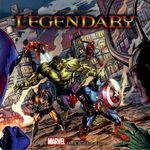 I sent the weekend off with another game of Legendary: Marvel. Playing with the base game only, vanilla solo rules. Thor, Wolverine and Emma Frost vs. Dr. Doom with the Brotherhood and Doombots playing the Replace Earth's Leaders with Killbots scheme. A very smooth game overall. 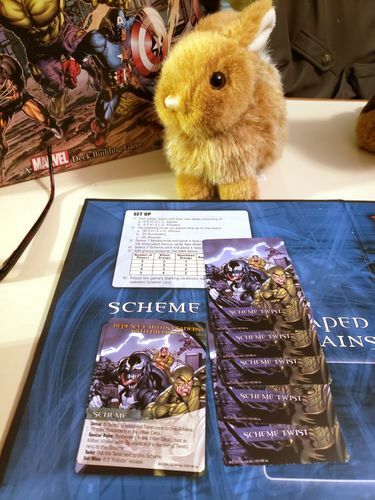 Emma and Wolverine play well together for card draw and Thor turns influence into power at will, meaning in no time at all we had ramped up our attacks enough to start taking on Doom himself. In the final round we had 24 attack points, enough to knock out Doom twice. I find myself wanting a little more of a challenge, so I'm ready to move on to the Golden Solo rules. I've played them before and found it significantly more challenging and interesting with them. I've also ordered the Secret Wars Volume 1 expansion. Looking forward to playing with some new heroes and villains. This game uses a point to point movement system with each unit having strength points rather than counters with the typical attack-defense-movement numbers on them. I will be curious to see how this plays out; if it goes well this could be a good, simple game for gaming the Eastern Front with low counter density and quick deployment which would be perfect when time/space constraints are in full force. My sixth play of this super satisfying Terra Mystica reimplentation and I think I got all the rules right this time. 130+ to 109 versus the easy level Automa. 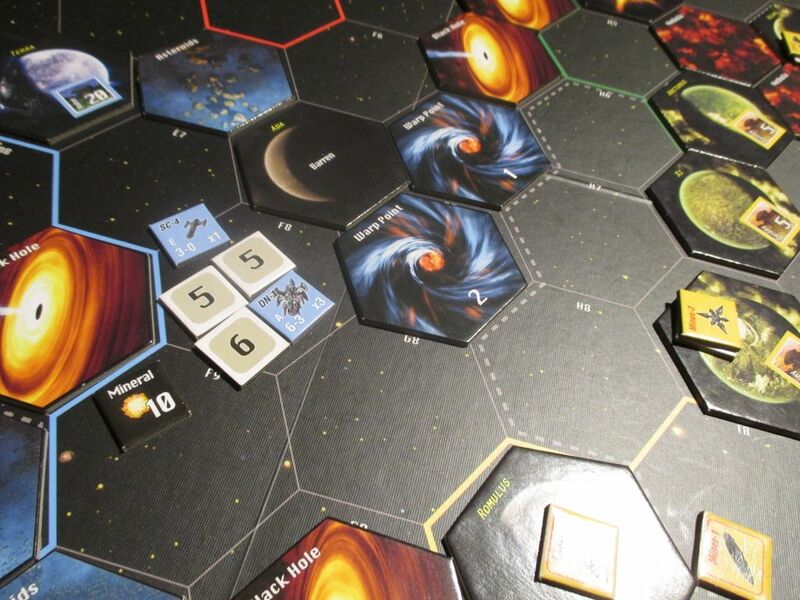 It's a great euro-style area-control game set in space. The Automa is by Automa Factory, and it's really good. It simulates players having more actions in later rounds, and it develops a play style over the course of the game. Each round it adds command cards from a deck, and those combine to create a sort of personality. This Automa was expansionistic and had almost no research going on. The one before was heavy into research buy didn't do a lot of building. I've talked a bit about how much I like the Scythe Automa's simulated endgame awareness resulting from switching the deck around on a specific turn. I'd say it's at least as good here and so far it has resulted in games that looked pretty different from each other. As much as I like the Scythe Automa (it's a marvel of modern game design), it pretty much moves towards you like a blob at an aggressive pace. My games against the Scythe Automa tend to vary most based on our relative starting positions. It's hard to write passionately about it though. I placed my bits in groups and built an engine that generated the resources I identified as important for my plan. I was trying something new out in this game, which was focusing on the research track early. I managed to get 4 out of 6 techs up into scoring range by the end. I had only one federation, which is very low for GP. 130 points is a pretty good beginner score I think. Or maybe it's terrible and I'm terrible. But it seems like people who report high scores are getting things in the 160-200 range. In that context, I'm fine with 130 in my first probably legit win. I say probably because it can be easy to miss a step. I think I have a good system for keeping track though. It involves a tiny Mega Man figure from the Mega Man board game used as a turn marker. Side note: That game is not great. The figures are cool though. I'm not sure why a game based on a videogame based on skill and longterm strategy would be a push-your-luck dice fest. Back to GP, I like it. I think it's good. No creeping sense of a hidden flaw and that's not surprising. A new version of a proven game is a pretty safe bet if it's in the genre you're looking for. One of my most ‘abnormal’ game I have played and solo a few games to get the hang of it. 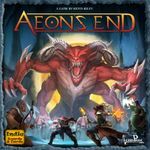 For a long time I had heard good things about Aeon's End but was put off from it due to the generic fantasy magic theme.Give me anything but generic fantasy! I finally saw the error of my ways and purchased it. It really scratches the deck building itch but has low rules overhead and is smooth to play solo two handed.I solo two hand a few of the Arkham games and AE seems smoother by comparison. I don't know whether that's due to less rules or components. I narrowly lost my first game due to the town being destroyed. I would have win if I'd lasted another couple of player turns.Setup is a slight chore due to randomly picking card sets. Anyway, a good game if you can stomach the extremely bland theme. 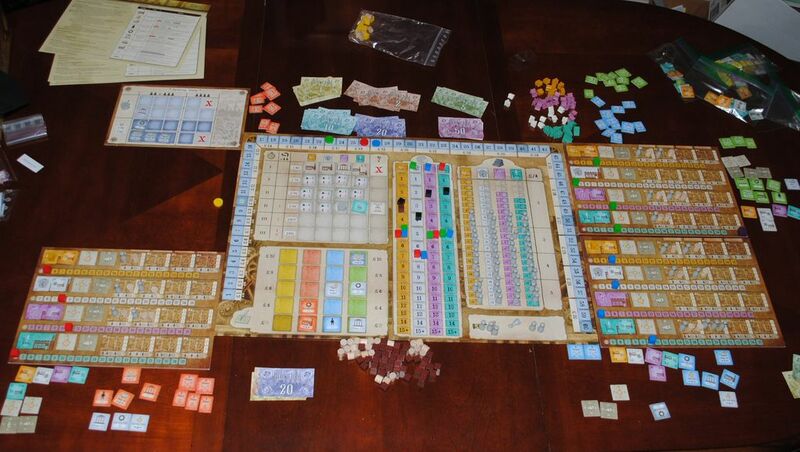 I've come to realize that I really enjoy the collaboration between Stonemaier Games and the Automa Factory. Shocking I know. So it's little to no surprise that this first post of SGOYT in the month of April gets an overall . After listening to the boys over at Solosaurus talking about Viticulture Essential Edition I decided to venture forth and start my own vine empire in the Italian countryside. 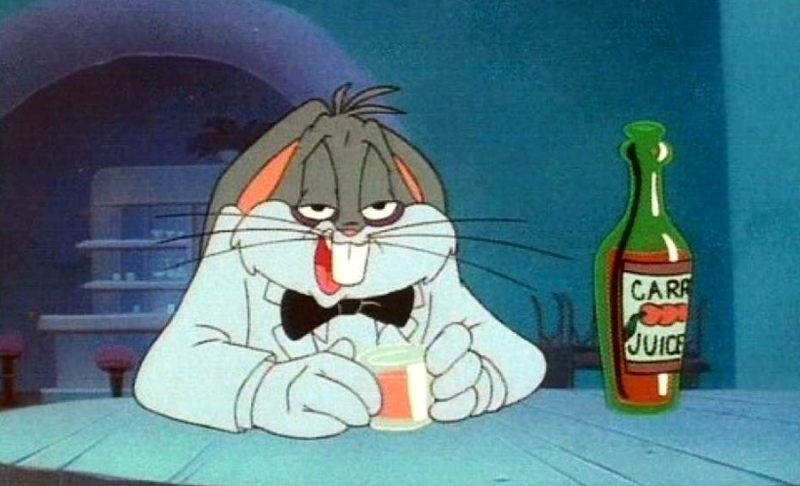 The life of a vineyard mogul took its toll on Bugs Bunny. 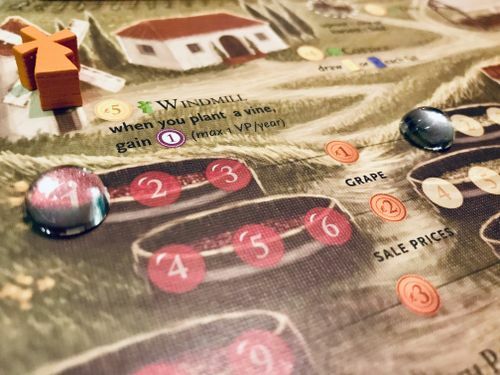 Viticulture is considered by many to be somewhat of a classic in solo board gaming, and I can see why. It's a worker placement at its finest and I do love me some solid worker placement. So I decided to crack open the rulebook and have a go with the official solo variant. First of all: the components are amazing! Wonderful custom wooden tokens and meeples, I adore the glass beads that are used to track grapes and wines, the art by Beth Sobel lends the whole production a flare of an oil painting. Initially I wasn't a hundred percent sold on the idea of including the portrait of people who backed the game on Kickstarter back in the day. But I have to say that thanks to the art of Beth Sobel it actually incorporates into the overall style and theme really well. The overall quality of the components are top notch throughout. 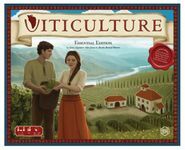 Viticulture: Essential Edition incorporates a couple of modules that was previously part of the Tuscany expansion. For example the Mama and Papa cards. 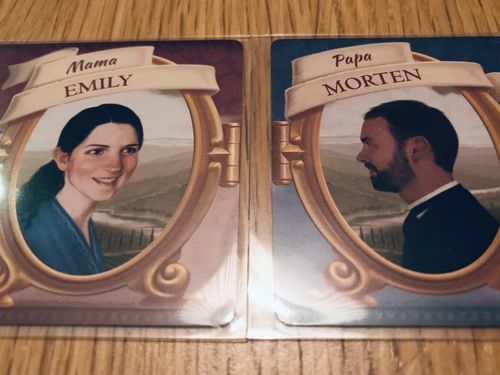 At the start of the game each player draws a Mama and a Papa card. These card provide you with your starting workers and resources. The mama cards focus on basic workers and drawing cards, while the Papa cards provide you with the Grande worker and some sort of money, building or victory point starting bonus. It's a nice way to provide variation to each game of Viticulture. Mama Emily and Papa Morten. A match made in heaven. I actually like playing a board game for the very first time. Since I know very little about the game in question as to strategy and/or tactics, it gives me a chance to simply explore and try out different things without any pressure of "performing well" based on final score etc. And so I started to build my vine empire. 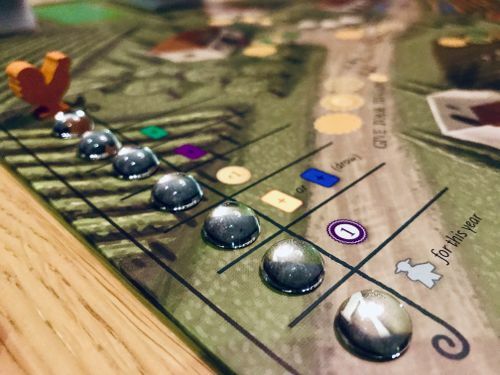 In the solo variant of Viticulture you have seven rounds to reach and exceed 20 points. The Automa deck is as simple as it is highly functional. Before each phase/season, where you place your workers on the main bord (summer and winter time in Viticulture), you draw an Automa card. That card will tell you to place 0, 1, 2 or 3 dummy worker meeples on the board. These Automa workers do nothing more than block actions on the main board. And yet this presents an interesting dilemma in regards to your Grande worker. 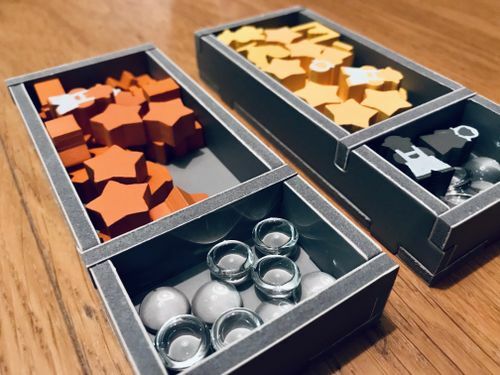 The Grande worker can "overrule" an occupied spot, allowing you to take the action even if there's another worker present be it yours or an opponents. And thus I found myself contemplating: "should I use my Grande worker during the summer time, or hold on to it until winter?". Because the Automa places workers both in summer and winter time. It becomes a tricky decision to say the least! My very first harvested grapes! "A journey of a thousand miles begins with a single step". Since you only have seven rounds to reach and exceed 20 points you really need to maximize every single action. I found that it was slow burning of acquiring victory points at the beginning. In order to fulfill a vine order, which provides VP and an increase in overall income, you need to acquire plants in form of cards, plant them on your field, harvest the field, convert grapes into wine, store said wine and preferably have the right age of the wine/grapes. And you have three workers to start with, that's a tall order to say the least. Each round in the solo mode also provides you with a bonus token in form of a glass bead. You can use this token in order to activate bonus action spots on the main board when placing down workers. The neat thing about this structure is that you can only place your round token on spots that have a glass bead. So it becomes a game of figuring out "right, which bonus do I really need for this round/year of the game?". In the end I tied with the Automa at 20 points, thanks largely to a good draw of winter visitor cards in the final rounds of the game that provided me with much needed VP. Overall I absolutely loved Viticulture: Essential Edition. 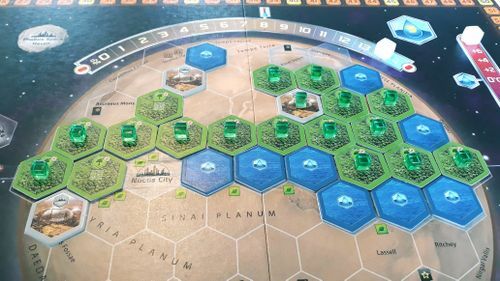 tight mechanics, a solid entry into the genre of worker placements. the Automa is as simple as it is brilliant, this is a solid solo experience. the production quality is top notch. I'll have to get back to you after a couple more sessions. "It's hip to be square" as Huey Lewis sang back in the day. And I am one square boy. So it's no surprise that I thoroughly enjoy a good insert as much as the next man. After some very busy weeks I was looking for a very relaxed game more on the simple side, something to fill the peaceful morning before I have to leave for work just before noon. Legacy of Dragonholt fits the bill. Basically a pepped up Make your own Adventure game it just does things right with good writing and interesting enough decision points. So far I am very pleased with it! Playing solo with two characters, knight-errant Lady Cee (for Cerophaline) and her snuggly half-catfolk side-kick Grrl-Perrh I just finished the introductory adventure To New Roads. 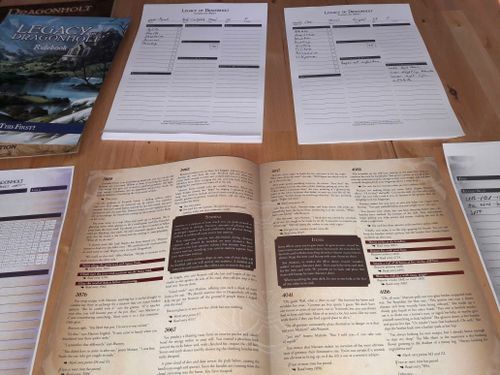 As you can see in my setup it takes up a little bit of table space with two character sheets, a campaign sheet and a tracking sheet for the current adventure, but the books comfortably stay open which is a bonus. Items you write down, but you also get reference Tarot-sized cards, which gives you an additional haptic element. I used a few poker chips (inspired by Too Many Bones) to track my Stamina losses, which works fine. Lastly the game makes it very easy to track where you are (I write down the segments I already read plus you track story points), so playing half an hour and then coming back later should not be a problem. The only thing I have to reread now is how the activation points work, when you play with several characters - I kind of fudged that to make the story in my head work best. 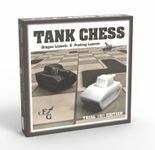 I have 2 games rated a 10 on BGG. To be a 10 it has to be a clean and fast moving solo that I absolutely love AND has to be equally excellent at 2p (and therefore Wifey must also love it). I only have a small collection, so this is an exclusive club! 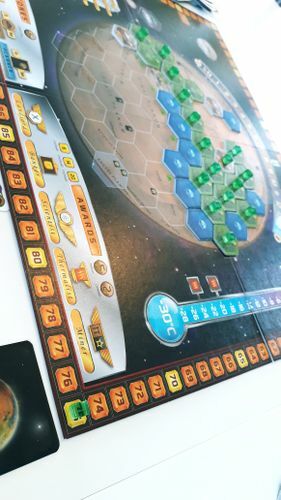 Pandemic and Terraforming Mars are my two 10s. Ironically enough I don't think I'm particularly good at either. Nevertheless I've been trying to get a solo win with each Base Corporation. Some lend themselves much more readily to this task (I'm looking at you Helion and Ecoline!). Terractor, Tharsis, Interplanetary Cinematics and Inventrix are the ones that I think have been the tougher tasks. Last night I took on Terractor, and got what I thought was a good titanium engine going that I could convert to water tiles via the Water Imports from Europa. Sadly I needed the last production phase to meet the Global Parameters, and thus lost. So as all stubborn gamers would do, I pulled it out again the following day and went at it with a vengeance. This time Terractor got big into heat early on using Underground Detonations to get the TR moving early on. The two free cities placed on the board blocked my expansion into the southern hemisphere, so I was all about the North, and finished with a successful terraform of 75. Not my best but good enough to clock up another win with the tricky corporations. Obviously I haven't got much in the way of for a personal favourite game. Maybe a warning for completionists; this game is becoming a CCG with all of the never-ending expansion content. Prelude + Base game is sufficient for me atm, perhaps an addition of Hellas and Elysium one day. I had begun this one in March, but have just finished it this morning. I had taken down the red empire during round #8. Last time I had also played at Harder difficulty and had found myself unable to resist attacks on three fronts. So this time I decided to stop waiting and take the initiative. That was on my first session. I then played another session, and could take down the green empire, who also had no defense point, on turn #12. 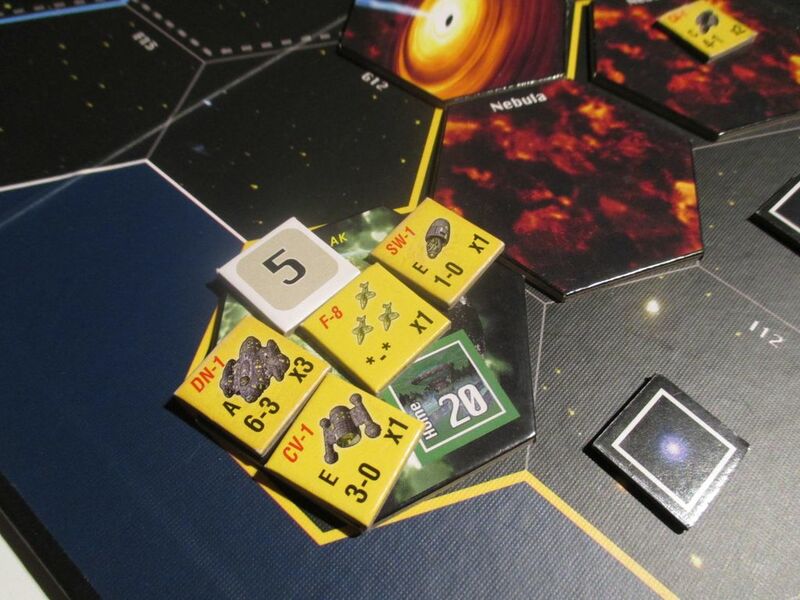 Rereading my home made player aid, I realized I had made a mistake on the red empire homeworld attack. The Alien Empire does make a fleet launch if he has fleet points when you attack it. Things would have been different then. I think I would have destroyed the red homeworld, but after some more waiting and more trouble. I did not make the same mistake with the green empire and I had a quite good fight. Today, third session, I had to take care of the blue empire. It had already sent a large fleet of Destroyers. The SC chit here represents an undisclosed fleet, which thereafter revealed to contain Cruisers. I sent a few suicide Scouts and then Cruisers to delay the blue fleet, and then had the time to send some Mines to destroy the Cruisers. It reduced a bit the fleet and then I sent Dreadnoughts and Fighters. That did it. After that, another fleet was defeated, and I sent a suicide Scout to reveal the blue empire 100 points defense : only Mines. I leveled up my Minesweeper tech, buit a few more Minesweepers, and sent them. And then an assault on the Homeworld. Victory. It's a great game. 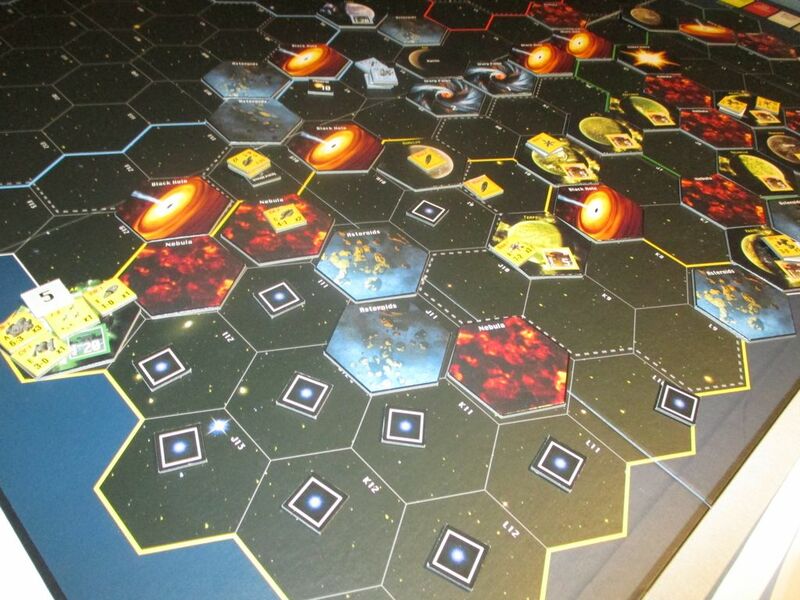 I prefer to play the Alien Empire scenario on several sessions. It's easier to begin a game this way. The Alien Empire AI is well made. The different techs and corresponding fleet are well managed. I should receive Talon+Talon 1000 in two days. I'm already reading the rules and cannot wait mixing both games to get a really epic combo. I'll wait to understand Talon and I think I'll restrict myself to two alien empires to avoid having too many fights. Edit : Oh, and I had forgotten Gary's recommendations for this month. To have these nice hex tiles, I had to spend 50 more euros, that makes a 100 euros game, and I have used the rules of only the base game. 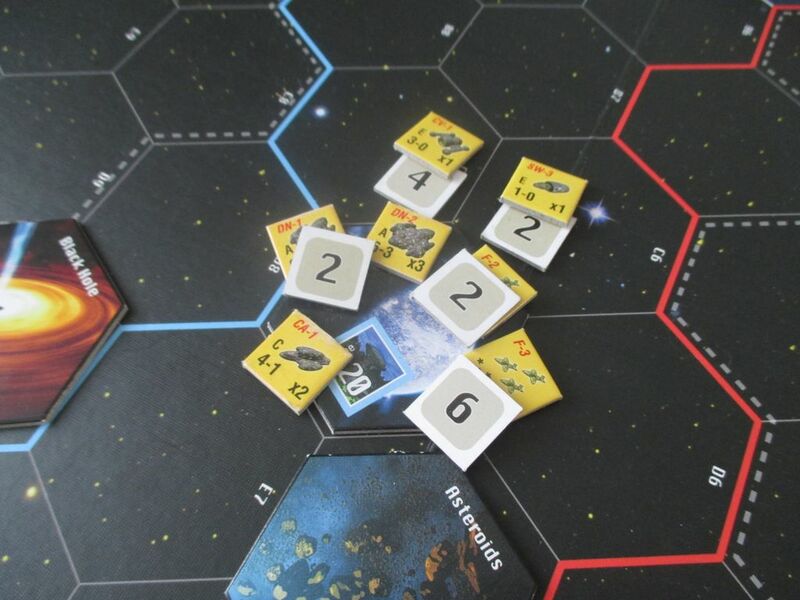 I may try the Replicators solo game from the expansion, but have not yet tried. There's a LOT in this game. You HAVE to get adapted plastic boxes to get all the various chits of the four empires sorted. If you want to have them fit into the box, you need a very specific format. Also, I was losing too much time on checking the AI rules and made myself a player aid. And I made a kind of insert for the hex tiles of the expansion. So there's some investement needed here. Some of my most used chits begin to deteriorate, I think due to my storage solution which is too small. I thus wonder if I should not let go with the idea of having everything in the original box and dispatch chits in larger plastic compartments. My friend Jennifer bought this so she'd have a solo game and asked me to teach it to her... so I played a solo game of it to learn the rules. 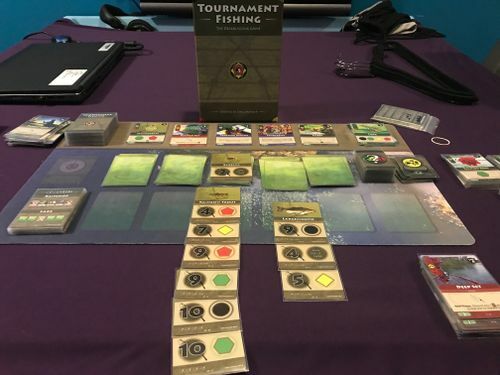 I played as Roland Banks with the Gathering scenario on easy mode (to learn the rules) and won. I had fun with this and may try to get my own copy of the game. I purchased this through The Game Crafter's crowd sale. 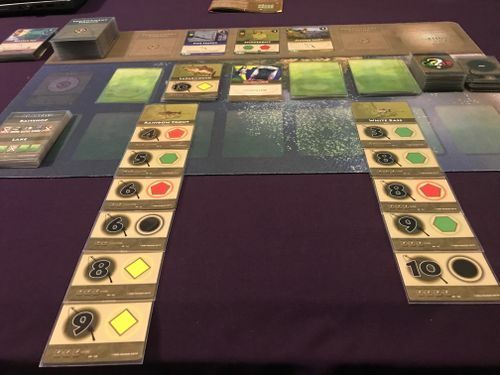 While I despise fishing in real life (have never caught a fish in my life, it's pathetic) I absolutely loved Coldwater Crown (fishing euro) and I love deckbuilders. So when I saw this I had to give it a try. The first game I lost 42-19. The AI was catching huge fish while I was struggling to balance the cards in my hand in order to either catch fish or go to the baitshop. The second game I found myself frustrated as I thought I had a better handle but lost 49-18. 4 different times "Pop" cards came up which means the fish snapped the line and got away. There was little I could do to mitigate this as I didn't have the correct cards purchased from the bait shop. Feeling frustrated I decided to push through it and give it another shot. This time I made sure to purchase some effect mitigation which was huge once again as I discarded a couple of Pop cards and managed to score my highest point total at 38, which tied the AI, which meant I lost. I love deckbuilders and this one is a lot of fun. Very quick setup which lends itself to playing multiple times in a row, especially since solo games take about 20 minutes. The quality of the cards, art, playmat are fantastic. I wish there was a mechanic to thin your deck. Don't really care for the tiebreaker. Another review up! 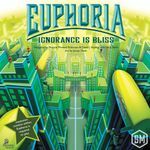 :-) This time, it's the new expansion for Euphoria. You can check it out here! 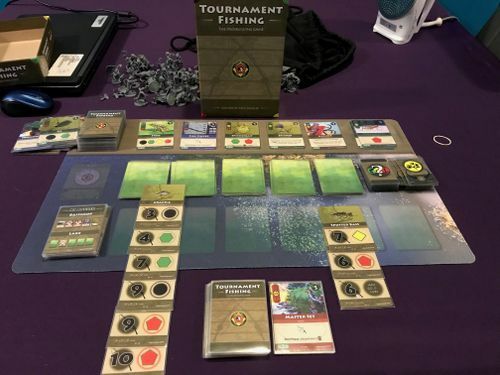 Tournament Fishing: The Deckbuilding Game looks to be the next game on the docket. Maybe I'll even make a crossover variant where you play Tournament Fishing IN Euphoria! I got a couple more rounds of this in with my variant. Works well. Balanced. I have won one and lost two and have no idea how close we are in the current game. 4 more licenses to go and it look like a dead heat honestly. The bot is able to launch more boats right now than I am so he may swoop in and take it in the end. The auction is fun. Only real interaction and it has made for some interesting and fun decisions. The remaining phases are pretty straight forward. Launch, Captain, Fish, Process/Trade, Draw. Had the chance to play "The Oath" scenario that comes from the collector's edition. It is about some pesky goblins who ransacked a village and your heroes will follow the trail to defeat those goblins. My heroes are Thalin and Beravor, my main questor; then Gimli aka Hulk who gets stronger when wounded. Trouble starts early not keeping up with the questing, also with the high starting threat of 30, it will only get worse. In the end, found the goblin trail and defeated the goblin troop for that sweet victory. Well, nothing to brag about this is just an intro game and my motley crew of characters composed of elf, some humans and dwarves who can be overpowered if gathered together. 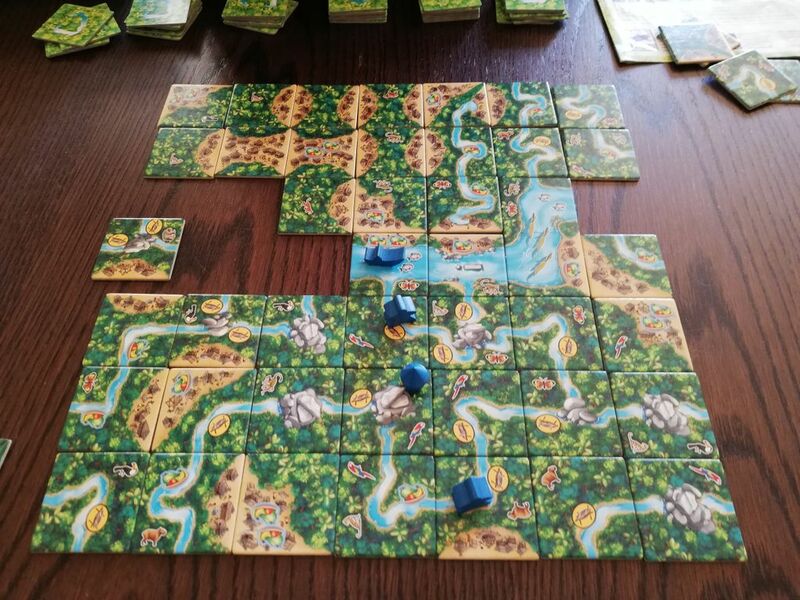 So I did another trial run today with Carcassonne: Amazonas and the Carc Island solo variant. First of all, I put aside the big starting board and used a single river segment as the central tile. I also ruled that whenever I drew a river tile with an "!" 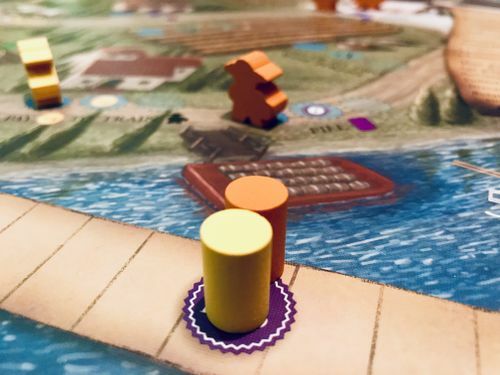 on it, I'd have to play one of the four double length river tiles as well. The choice of tile would be up to me, so that it wouldn't be too hard to fit the tile into the island. Still, not all hope is lost on this Carcassonne spin off in regards to solo gaming. After the game I thought about using the boat to allow replacing tiles next where the boat currently is located on the river. That would make river placement a bit easier and give the boat some use again. You'd have to paddle to the spot on the river where you'd like to replace tiles first which shouldn't make the game too easy. I am trying to play the first scenario but keep thinking that I'm missing something because I have so little to do in stopping the two armies from fighting. And I've also hit a bunch of "Move" armies and they are face-to-face so basically nothing happens each turn. Strange game so far but I'm sure I'll have an "A-HA" moment.